Now, nearly three decades after they last worked together, Tim has put together the music video for Randy’s latest political song, “Putin,” which debut this week. We caught up with Tim by email to get the scoop on their latest collaboration. Is this the first video you’ve done for Randy since “I Love L.A.”? No. In 1988 I did a video for a song called “It’s Money that Matters (in the U.S.A.),” which followed further adventures of Randy, the Buick, and the “Big Nasty Redhead”, including flashbacks of Randy and the Redhead when they were kids … perhaps you weren’t aware that they grew up together, and despite this fact, as an adult, she’s a lot younger (and better looking) than Randy … joking of course. 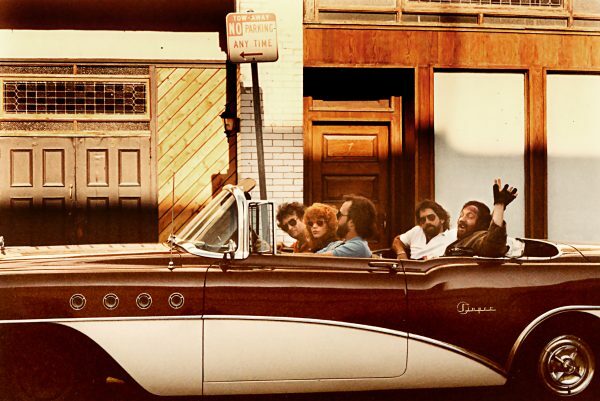 On the set of “I Love L.A.”: Randy Newman, the Redhead, Gary Buonanno, video producer (driving) in the front seat; Tim Newman (white shirt) and Bob Emerson, who played the Bum in “I Love L.A.”, in the backseat. “Putin” is one of group of new songs Randy had been working on for a while. He sent me piano demos for all the songs in the late summer of last year. We both agreed that the Putin song was ripe for a video. I said I’d see what I could do, and took it on sort of as a hobby with no guarantee that there’d ever be a video. Neither of us had any thought that live action shooting would be involved. If you don’t know, Putin is one of the most photographed people in the world, so the research was really fun. Did he say he wanted anything specific for this? No. He never has, in any of the things we have worked on together. We’ll discuss things generally, but he’s not so interested in having a direct involvement in the visual stuff. It makes him great to work with. He got opinions, of course, but he’s totally open. How long did it take to create this video, start to finish? Hard to put a number on it. There was no deadline until mid-September of this year when the song was finally finished, and they (Randy and his label) decided to release the Putin song as a stand-alone right away. Then the finishing of it turned into a pretty intense deadline (typical). The full album won’t come out until spring 2017. From when I started in August of last year, I worked on it on and off at my own pace, and probably had a rough done sometime ib October. Like I said, I’d fool with it when the mood struck me. Actually I’ve never been in project that casual before. I spent a lot of time digging for images on Google. And then working with stock images sources like AP Images, Reuters, Alamy and a few others. They were great to work work with and have amazing libraries. The essential creative task, really, was the image selection. It took a long time and a lot of looking. And then re-looking. And re-looking. Then, the actual “edit” was picking the right image to convey the intention of a particular lyric, and in some cases, combining it with something else to make a stronger impression (like as shot of Putin looking kind of evil at some meeting, instead cut out and put in front of a line of tanks at a May Day Parade in Red Square). After October, the project languished until spring of this year when Randy decided to re-write the lyrics of the last third of the song, meaning I had to redo roughly a third of my work. New image selection, etc. But he was right. The new lyrics really were way better. From an emotional point of view, working with stills is limiting, but of course quite a lot can be done to alter them to create a more unique look. 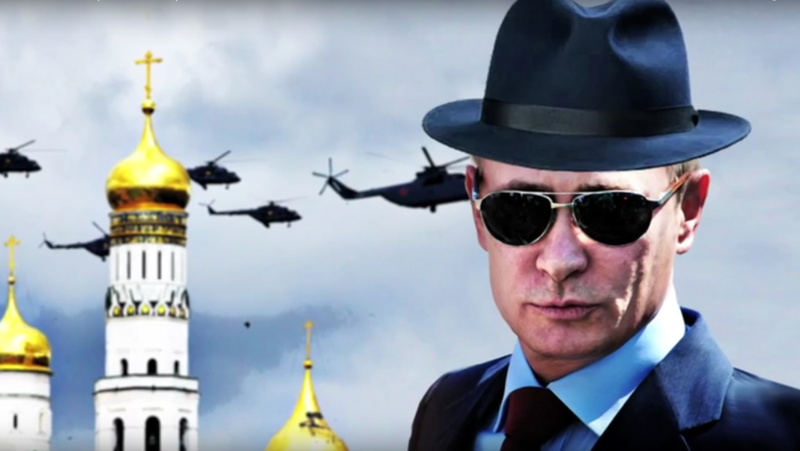 And compositing—combining 2 or more images —helps to make stronger story telling (like Putin wearing shades and a hat that I put on him, in front of the gold domes of the Kremlin and airborne helicopters). What I did is not remotely as rigorous as animation, but there were a lot of composites. And the images are “treated” with a kind of illustration-y effect and with some, I create a little movement. I wouldn’t dignify it by calling animation, but it was rather time consuming. I love Photoshop so all the stuff was really fun. What programs were you using to achieve this video? All the image manipulation was done in Photoshop. The edit done with my antique version of Final Cut Pro. When’s the last time you spoke to the guys in ZZ Top, or the girls from the Eliminator album videos? I exchange email with Wendy Frazier occasionally and see her Facebook feed. The guys I haven’t talked to in a long time. Billy was touring behind his solo album and was supposed to perform in NYC, last summer I think, and I was going to go, but I think he got sick and the date was cancelled. I never found out if he did a make-good. If he gets back this way it would be fun to say hello. 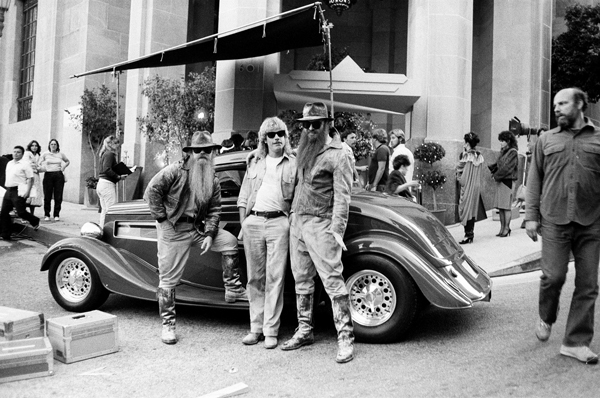 Do people still regularly ask you about those ZZ Top videos? Yeah, if people find out I did that stuff they’re interested and impressed. Go figure. Where can people find your latest work? I’m pretty much out of the biz. Have been for at least 10 years. I live in the Berkshires and do a bit of graphic design. That said, I’m always game for anything interesting that involve images and music.